NAD 3020B: Keeper or Clunker? Been a while since I last posted on anything audio-related – I’m taking that as a good sign because I know I’ve been enjoying a *lot* of music lately. Many an audiophile posting online has an extremely polarised attitude towards the humble NAD 3020 series of integrated amplifiers, which seem to be very much a “love ’em or hate ’em” box. I always thought I was in the “love ’em” camp, but until I inherited a 3020B from my father at the end of last year I never quite knew why. It’s not been the easiest of journeys, so please bear with me as I try to explain what I’ve found and what was going on at the time I found it. If there’s any one lesson to glean from this experience, it’s that getting hifi sounding good is as much about the interaction of components working together as it is about finding of well-engineered components and slinging them together according to a spec-sheet. These are also differences that I feel can make or break a system over the long term, but may not be immediately identifiable in typical demonstration arrangements that most stores can offer. When inheriting our current system, my intention had been to replace my existing components one-by-one so I could check how the sound was changing at each stage on the way. I first swapped the speakers, as mentioned in another post. I then started repairing and using the record deck – plenty of other posts on that particular subject. With that now mostly bedded-in, i’ve come to the final part – using the 3020B. As a whole the unit feels well manufactured. Years of dust needed cleaning out of the phono contacts before connecting anything, but the speaker output binding posts are firm and accept 4mm banana plugs without modification – this amplifier was made in the generation(s) before the EU got their teeth into manufacturing regulations in the mid-90’s. The source-select buttons are known on this series to be of slightly cheap construction, resulting in the plastic caps flying across the room when a new source is selected. Also, the source input sockets are somewhat loose. This might be a result of their PCB flexing slightly when connections are made, or it might just be that the dimensions tolerance of the sockets themselves isn’t quite right. Again, this is a common flaw with amplifiers of this series, perhaps even of this generation. The switches operate silently so far as the audio path is concerned, and the Bass, Treble, Balance and Volume pots/knobs also operate silently – rather impressive for such an old unit, especially if it’s ever been exposed to cigarette smoke, pets, small children and life’s little accidents as I know this one has. Overall this unit is in better physical condition than I could have asked for – some surface grime aside, it’s basically unmarked except for the small hole drilled into it side where an intruder-alarm used to have a line threaded through it as a crime-prevention method. It’ll be an extremely rare find on Ebay that turns out in such good condition. Used with the Tannoy Mercury M20 loudspeakers it had been paired with in its previous home, the first impressions were that it is far warmer in tone than the 302 I was comparing it to, even with all tone controls at neutral and the loudness control off. Bass has more depth, stereo imaging is wider and deeper, but treble felt like a veil had been placed over the speakers. Some experimentation with the Soft Clipping circuit showed no audible difference whether it was switched “in” or “out”. I prefer to be safe rather than sorry, so I’ve left it “in” for now. Another interesting experiment was to assess any audible differences between using the “Normal” (Low and High-pass-filtered) and “Lab” (Unfiltered) power amplifier inputs. Theoretically the “Normal” input should be used, to filter out frequencies below 20Hz and above 20KHz, enabling the amplifier to use all its power in the audible frequency range and to run without interference. The “Lab” input sounds better to my ear – soundstaging feels more solid, and the tonal balance a little more accurate throughout the entire frequency range. (See the first comment on this post for more about the correct selection of “Normal” vs “Lab” input). Even having worked out which signal path to use, and to avoid the “Loudness” button, the amplifier was still not producing an overall sound I thought I could live with. I therefore started to do some tweaking to work out where the “problem” was, if only to understand what was going on. Both the 302 and 3020 have pre-out and power-in socket sets, allowing either to be used as the power amp for the other’s pre-amp section. First of all I wanted to see if the older 3020’s pre-amp section was the cause of the slightly muted treble. Some re-plugging later, I had both CD and LP feeding the 3020 pre-amp section, which in turn was wired to feed the power-amp of the 302. This combination had narrower imaging, slightly leaner bass, and still the soft treble that felt like it was hiding something. Next I swapped the amp sections round, with the 302 pre-amp now feeding the much older power-amp section of the 3020, and everything seemed better. The soundstage was locked tight between the speakers for centred instruments and vocals, but there was much freer reign for anything panned between and even outside the speakers to be given space to do their thing. Either amplifier seemed equally capable of playing ‘depth’ information in recordings that have it, and so this was the way I left the units set up for some weeks while I got settled with the record deck and its cartridge. Listening to the Tannoy’s through the 302 (using both its pre and power sections) I thought the sound was nicely tonally balanced, but always felt like I was listening through an imaginary window that the box placed on the musical world being painted in front of me. Conversely, the 302-pre and 3020-power combo gave slightly more extreme bass and treble presence, and effectively took away that windowed effect while fixing the veiled treble of the older amplifier used on its own. System changes – a second chance? Having settled on using the 302 pre-amp and the 3020B power-amplifier, a couple of things changed. First off, I found the new complexity of the system somewhat frustrating, but were willing to live with it if that’s what was going to give us the best overall sound. Then came the other major shift in our listening; I upgraded the phono cartridge to a Denon DL-160 MC (High output), seeking more accuracy of sibilants and better soundstaging. This much I got, but then many recordings were now too bright. Whether this was a result of longer-than-optimal running times on some discs, or perhaps due to an active mastering decision, I’ll likely never know. With the new cartridge in place, switching between 302 and 3020 phono stages showed the differences between them were surprisingly subtle, but the older stage won out. It seems to reveal more midrange detail than the newer design, particularly with female vocals. There’s also a lot more information being played from the background of mixes, better rendering things like room ambience and reverb tails. It also has better overall dynamics, and the soundstaging is a little deeper and wider. This surprised me, since on paper the older design looks like it should perform worse than the new one. For one thing the signal-to-noise ratio quoted by the manufacturer is slightly higher in the older design, and I would expect its component tolerances to have drifted enough with age and use by now to have a significant negative effect, likely leading to loss of high-frequency detail and increased noise. Just one side-note on the 3020 phono stage – it has two modes, one for MM (Moving Magnet) cartridges and the other for MC (Moving Coil) cartridges. MM carts typically have higher output levels than their MC siblings, but our MC is a “high output” model, compatible with conventional MM stages. Having tried the unit in both modes, neither sounds different than the other, even when the setting is “wrong” for the kind of cartridge in use. The phono stage shows ample headroom – I did experiment with using the MM cartridge with the extra amplification of MC mode and could hear absolutely no evidence of added distortion, even with discs mastered with very high recording levels. Further, using the MC mode with its extra gain ought to bring more measurable background noise into the mix, but I’ve yet to hear this in practise. I decided to give the amplifier a second chance to fly solo, with vinyl as the primary source. Soundstaging now sounds wonderful with well-mastered discs in good condition – Pink Floyd’s “Dark Side of the Moon” and Eric Clapton’s “Slowhand” show a lot of their natural recording ambiences. Newer, more synthetic recordings like Enya’s “Watermark” or Jean Michel Jarre’s “Revolutions” sound as modern as their source material and production values should present, with the end result sounding always convincing and really very human. Every instrument and voice has its own space in the mix, with no particular instrument or frequency range standing out above any other. Poorer or duller discs can easily be improved with an adjustment via the tone controls. The effect of the tone controls is subtle but effective – I don’t feel like either circuit (Bass or Treble) impedes any other aspect of the sound passing through it other than whatever I’m telling it to do. Most bass-light recordings are usually too heavy in the treble, so a slight treble reduction usually brings things back into perspective. The inverse tends to be true if a recording is bass-heavy – usually a slight treble boost evens things out. Turning to digital sources, playback again felt like it was lacking some treble at first, and the soundstage was somewhat vague. For most TV and DVD content we watch this isn’t a bad thing, and easily fixed with a slight adjustment to the treble control. With playback of CD or downloaded content from our EMU 0202USB, it seemed that while bass and mid-range were coming through with much more timbre than I’ve been used to, and a much more even tonal balance, the high-frequency content was being reduced slightly, and felt slightly hazy, if such a term can apply to audio. Having noted a slight increase in treble response over the few weeks the system lived in this new state, I’d have been happy to leave it there, concluding that either the increased usage had brought some components and connections back within tolerance, or (more likely) my subconscious processing of what I’m hearing was adjusting to the new system. But then I made a discovery: I could change the settings to run the DAC at a much-increased sample rate of 176.4KHz and 24-bit, with internal volume processing being done in the computer at 32 bits. This had the overall effect of giving slightly more audible treble, but more importantly it gave a lot more definition and control to the treble content. I’ll likely write separately about this transition, but it really does take the digital playback to a level that competes with the best of what our vinyl source can give us. Listening to Royksopp’s “Senior” album for example, bass frequencies go into (and possibly below) sub-bass territory and the system keeps up, resolving the basslines with good speed – at no time does any bass note feel like it’s stopping later than it should. Synthesised kick drums tend to have very short attack times, and these are resolved wonderfully, the tonality of each kick drum making even different synths identifiable. This is something I’ve never experienced before. Remastered recordings I’ve complained about before (Al Stewart’s “Year of the Cat” and Genesis’ “Trick of the Tail”) are still a little too treble-heavy for my tastes, but have huge amounts of spacial and vocal definition, and are finally on a par with the original vinyl releases of the same albums. Based on some very practical testing, done by ear and confirmed with others who were unaware of the tweaking going on behind the scenes except for the cartridge upgrade, I have concluded that my 3020B is very much “a keeper”. Its warm tonal balance is generally flattering and does not interfere with the finer details of dynamics, soundstaging and definition. It is certainly able to show up any flaws of the recordings and source devices it’s amplifying. I think it fair to surmise that it does a good job with entry-level devices as they come out out of the box, but it does a truly great job when fed with higher-end devices, whatever form they would take. I have Dad to thank for my love of all things hifi and all things musical – and somehow in December he agreed to let me give a new home to the core components of the hifi system that started it all. After unloading, I figured the mains-powered electronics would need some time to warm up to prevent condensation due to having spent four hours in the boot of a very cold car causing problems. So the first thing I did (after pouring myself a hearty Whisky Mac) was to get the speakers running with my existing gear – a 15-year-old NAD 302 I bought new in 1995, fed by iTunes played at 88.2KHz 24-bit through an EMU 0202USB audio interface from an elderly second-generation iMac. To provide a reference point: my previous speakers were an unknown-model 3-way Magnat design, each employing a 1″ metal tweeter, 2″ high-mid paper cone, and an 8″ mid-bass treated paper cone. These were themselves a bit of a bargain when I found them. The cabinets about the same size and shape as the Tannoys, and when purchased new I would guess they were at similar price-point. I’ve grown used to a slightly over-loud treble from the Magnats – perfect for the room I originally bought them for, but not so good in larger, more open spaces with less damping, such as a typical open plan living-room/kitchen/dining-room that they’ve served for the last year or so. Though well-extended, the Magnat’s treble delivery doesn’t quite sound ‘real’, and they could have trouble delivering a stable, centred lead vocal. Since each cabinet measures the same response using RTA/pink noise, and the drivers/cabinets are undamaged, I’ve yet to find a cause for this. Otherwise their sound was slightly warm and reasonably accurate, though I did find myself removing the bass-port tuning tubes to provide a more natural, dynamic bass-line. Curiously this also extended the the audible bass response by another octave. By contrast, the Tannoys are a two-way design using a 1″ silk dome tweeter paired with a translucent white plastic 8″ mid-bass driver. Their sound is much warmer and smoother than the Magnats, with well-defined bass-notes that don’t noticeably allow any one bass note to play louder than any others. Upper bass notes are actually slightly less prominent than I’m used to, but there is a stronger and more accurate response below 100Hz, allowing kick drums and sub-bass lines to underpin the mix even at very low volumes. The sub-bass lines of any material I’ve played through them have shown they can keep up with the rhythm of even the fastest Prodigy or Underworld tracks, as well as allowing movie soundtracks enough bass to not need a sub. What I remembered about these speakers in their original home was that they hold their soundstage together at extremely low volumes – this bodes well for micro-dynamics at more normal listening levels, but also allows for very enjoyable late-night listening when everyone else has retired to bed. At more ‘normal’ listening levels (around 60-90dB depending on source and time of day) these speakers really come into their own, painting a very natural image and revealing the differences between recordings like nothing else I’ve spent significant time with. I would say the real magic with these speakers has to be the way they present vocals. They don’t do the usual high-end hifi fancy trick of making the vocal sound like it’s right in front of you and about to take your face off – and I’m aware that some might say this is a bad thing. Instead, they present vocals in a way that seems effortless and yet somehow forces me to hear every last word, and they seem to do this without obviously emphasising any particular frequency range commonly associated with vocal intelligibility. It’s almost distracting at times – a song playing in the background suddenly demands attention in a way I’ve not experienced before. That is a stunning achievement now, but somewhat surprising considering I’m listening to boxes made some 25 years ago. Really, my only criticism of these speakers is that the treble doesn’t seem to obviously reach as high as I’d like. Anything above around 13KHz seems slightly muted. This has been a lot of fun – these are speakers I can live with for daily use, yet are revealing enough to tell me when something’s not right in the recording or the playback chain. And finally: thanks Dad, for letting us rob you that Saturday afternoon! Turns out that the speakers we have may not be the “Golds” that we all initially thought they were. 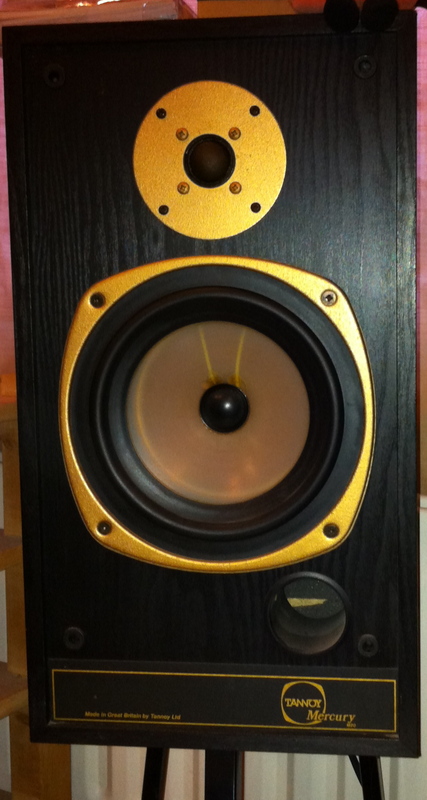 Ours are single-wired and marked as Mercury M20 in a gold logo at the bottom-right corner of each speaker. The M20 Golds I’ve seen recently were biwirable, and featured black-plastic mid-bass drivers in place of the white units in ours. I’ve therefore updated the model references in the article and the title. Whether or not ours are really “Gold” or just standard M20’s, nearly two whole years have passed since the original posting, and I stand by my comments about the sound of our examples – and I’m not looking for replacements anytime soon! So it was my birthday, and I’d been given some beer-vouchers for the privilege. Thing is, I can drink beer pretty much anytime I want, so I decided to put the cash towards something a little more useful. For a long time now I’ve been feeling somewhat limited in my photographic tools. Not that I want to fall into the all-too-common trap of letting the tools define my work, but from a very functional perspective I was feeling that the Sigma 28-300mm zoom lens I’d carried from my first Nikon SLR kit to be somewhat lacking in some areas. Sure, the Sigma takes more than reasonable pictures, but it’s a slow lens when used anything longer than 28mm, I’m not entirely enamoured with its colour handling. The biggest problem I have with it however is that it’s a real pain to focus manually; the focus ring doesn’t need to be turned very far to get from closest to furthest distance settings, making precision a thing that is guessed at rather than measured. Oh, all of that, and the damn thing changes focal length or focal distance when I’m adjusting the other parameter. The other area of photography that interested me a lot when I had a compact camera capable of such shots, is macro (close-up) work. It’s amazing what detail there is to be found in all manner of everyday objects, people, flora and fauna. Looking in more detail at these not only gives fascinating images, but an even more fascinating insight into the designer of said subjects – the same truth applies whether we consider said designer to be God or Man. A couple of years ago I bought my first prime lens – a fixed 50mm model that with its reasonably wide-open aperture of f1.8, it gathers enough light to use indoors at reasonable ISO’s and shutter speeds, without flash. This lens was a revelation. Not only did it open up a world of new photographic opportunities, its overall quality (and the quality of the shots it produces) is far above the standard kit lens that came with the D40. The only downside? Manual focus only, as it lacks a built-in focus motor. No big deal for me, since I’ve come to prefer manual focus anyway. Just before Christmas last year I found an elderly Vivitar 28mm lens, mentioned elsewhere on this site. Again, the clarity and sharpness of the lens far exceeded either of the zoom lenses in my kit, and allowed for indoor shooting without flash. Both prime lenses feature stiff, half-turn (or more) focus rings that allow far greater precision than either of the zoom lenses. I would guess that this explains why the prime lenses have given much sharper shots than their zooming counterparts. I can do wide work with the 28mm lens, and the majority of my work with the 50mm lens – but all too often I was having to swap out to the Sigma lens (and deal with all of its shortcomings) because I needed a bit more “reach”, or to make portraits that looked slightly more natural. In the end, I would avoid any portrait shots as I didn’t want to take such terrible pictures of the subject! I also worked out that all too often I really needed a zoom range somewhere in the middle of the Sigma’s range, but would end up setting it to the full 300mm not only because I could, but also because the lens tends to slip away from where I want it if I’m taking a photo at anything other than purely horizontal perspective. Aim high or low and the lens wanders. Terrible. So what I needed was: A lens in the 100-150mm range, with an appreciably wider aperture than the Sigma, and with better control over focussing – like the other two prime lenses. I did some research during a much-needed day off work, mostly by looking at Pixel Peeper and Flickr. Both these sites allow the user to search for specific lenses, and will show images registered as having been taken with them. This allowed easy comparison of various options from Nikon, Sigma, Panagor and Hanimex. I eventually saw that pictures taken by the Nikon lens were sharper than most others, and seemed to have a more pleasing tonal/colour quality than the others. That said, the Nikon lenses were more expensive and the others did tend to give better contrast. So I wound up looking around the Internet for used camera stores in London stocking the Nikon 135mm f3.5 lens, and found plenty of examples for around £50-£100 depending on age and condition. At the same time, I also was looking for a reversing ring, which would allow the mounting of my existing 50mm lens backwards onto the camera body. This allows the lens to work as a macro lens, focussing on subjects around 6-9 inches away from the lens. The research basically led me to look at two stores, one in London and one in Croydon. The London store, Grays of Westminster, looked to be the “gold standard” of used camera-gear stores and had a very good range of lenses in store. I sent them an email one morning and they hadn’t got back to me by the end of that day, so I looked elsewhere. This latter search led me to Mr Cad in Croydon. Eventually Sarah and I took a trip to Mr Cad, and found a veritable Aladdin’s Cave as our reward. This store is about 10mins walk away from West Croydon rail station, and run by a guy whom I can only describe as a friendly mad professor. He’s been in the business for years, specialises in old film-based photographic gear, and clearly knows more than his fair share of the business and the practise. On the advice of his assistant, Mike, I was able to try four lenses. Two of these were Nikon-made (one “Q” version, the other was “QC” which was newer and deployed technically better optical coatings than the older “Q” lens), and the other two came from Panagor and Hanimex. It was clear in the end that the Nikon lenses were better, and that with my gear, in that store on that day, I was unable to tell the difference between the “Q” and the more expensive “QC” lens. 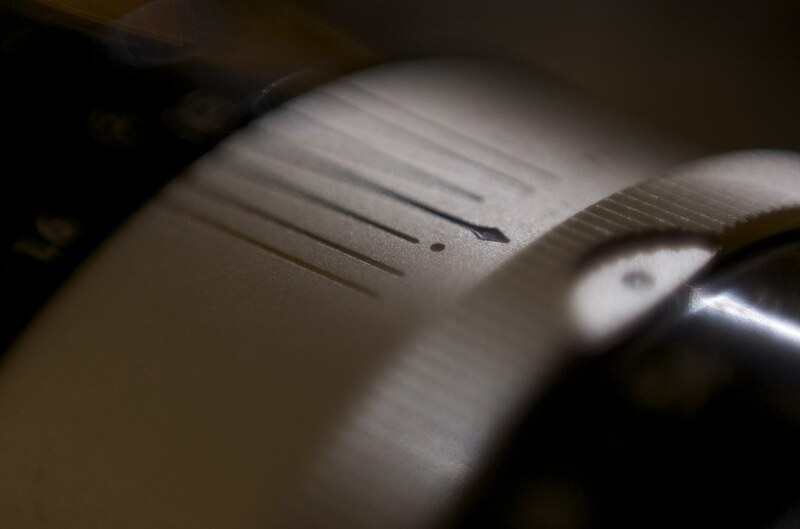 I decided to buy the cheaper lens, as well as a reversing ring found on a nearby shelf to scratch the “macro” itch. The lens I purchased looks from research to have been made sometime in the 1960’s, and has a lovely weighting, turning a range of around 300 degrees to focus between 4.5 feet and infinity. Okay, so the only thing to prove was that “I’m right” – in that having done the research, the results of the products themselves matches the promise of what I found elsewhere. Well as it happened we were blessed with a day of wonderful weather – sunny, but with some occasional cloud cover and a very light haze in the distance. The results of the 135mm testing are here. I also managed to get some macro shots in when I could persuade myself to let go of the 135mm for a few moments – results of *that* testing are here. I’m very happy with the purchases, and am very much looking forward to further getting to know the new lens!